Huge glass in the soaring living area of this Block 10 home overlooks open space and the walkway to Hecla Lake. Ask Michael Markel where a home buyer can find the company’s business model in action and he’ll tell you about North End, the popular Markel Homes community on South Boulder Road in Louisville. Markel, founder and president of Markel Homes, believes in giving buyers choices. Nowhere is that credo more apt than at North End. The buyer with an eye on Louisville will find all of the company’s easy living products as well as single-family homes in ranch and two-story styles. Several homes feature main floor master suites in a nod to buyers keen on the ease and comforts of single-level living. Markel has been fine-tuning his Boulder-based brand for more than 40 years, a brand that showcases great design, sustainable, quality construction and diverse architecture in a variety of home types, all in the best locations. the ease and comforts of single-level living. Buyers on the hunt for new construction in Louisville can find move-in-ready homes at North End as well as homes under construction, with completion dates beginning this spring. The homes feature open interiors, large kitchen islands and gorgeous hardwood flooring. All have outdoor living areas, unfinished lower levels and attached garages, in contemporary and newwest elevations. Pricing starts in the high $600s. 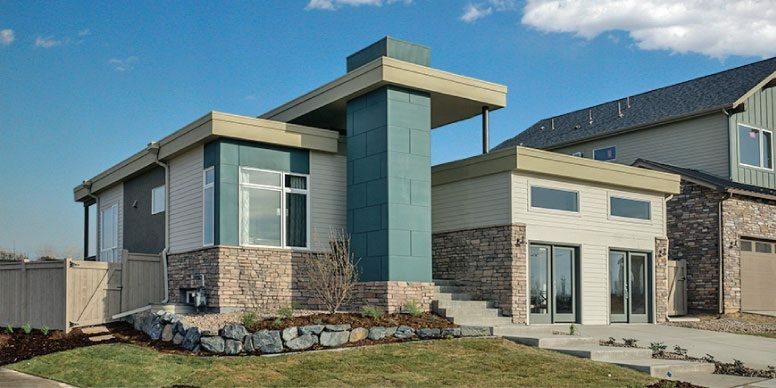 North End’s appeal to buyers extends beyond the homes to the look, feel and layout of this well-designed community. A walking path winds its way through North End, circling the peaceful and beautiful Hecla Lake Open Space. Views of the stunning Back Range are part of the neighborhood experience. Cyclists can easily connect with the area’s trail network. The rise in terrain in the northeast section – the last phase of construction at North End – features single-family homes on larger lots with lake and mountain views. Adding to the appeal is the close proximity to grocery stores, banks and other services. The lively Main Street in downtown Louisville is only minutes away. 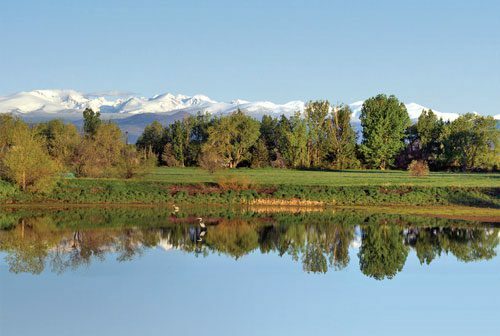 Peaceful Hecla Lake, nearby open space and stunning Front Range views are highlights of the North End community in Louisville. Louisville’s colorful mining back story combined with modern day perks like music, beer pubs and great schools for the kids are just four of the many reasons for the city’s popularity. The selection of restaurants, the cultural activities, healthy economy and city’s family-friendly vibe have landed Louisville on Money magazine’s “Best Places to Live” list numerous times. Presales are robust for the easy living condo lofts in the third and final 12-plex located on Hecla Way. 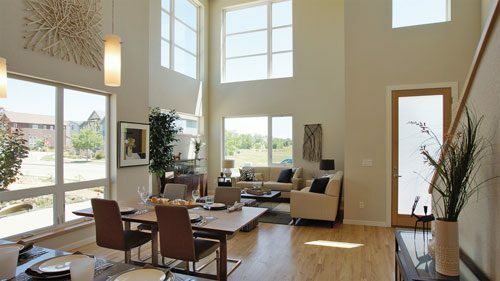 Contemporary features, large windows and the butterfly roof give the 12-plexes their distinctive style. Every condo occupies a corner location with large windows in the great room and master suite. Condo owners enjoy the convenience of a single-car garage, outdoor living on a patio or deck, and an elevator in the building. Pricing starts at $389,900. An open main floor, large island and distinctive fireplace create a warm ambience in this contemporary North End home. The North End Sales Center, located at 1805 Blue Star Lane in Louisville, is open daily 11 a.m. to 5 p.m. (Tuesdays 2 to 5 p.m.). Contact Sales Manager Michele Steward by phone at 303.604.9196 or via e-mail michele@markelhomes.com. 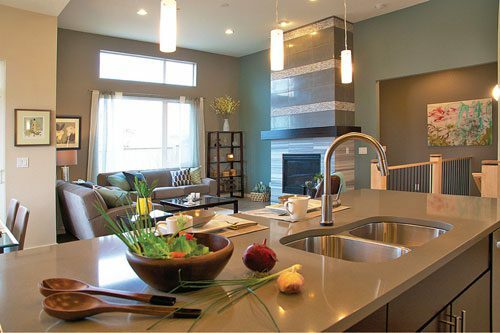 For more information about North End and the other Markel Homes communities located throughout Boulder County, visit the company’s website at MarkelHomes.com. You can also follow Markel Homes on Facebook. By Rebecca Lee, for At Home. Photography by Markel Homes.